As many of you know, Josh got selected for the 2019 Jp Dirt N Drive. This thread is so we can share the experience! We are leaving 4/7 Sunday morning early, we are driving his 17 JK Rubicon Recon all the way there and back, we will get off I 40 in Jackson TN and not touch interstate again! Taking 412 and 64 all the way! Arriving Tuesday somewhere in NM. Wensday is tech inspections in Farmington Nm and vendor show. Thursday we head for another town on dirt and trail!! Cant say the other towns, they asked not to reveal that info, radio frequencies are secret till we get there. Stand by for and adventure!! So..I've been wanting a rv for a while. Been looking and wishing and looking some more. With new ones selling for 70 80 90k and up, I could only afford to think about used ones. So when Chip placed his for sale on here, it caught my eye and as soon as I found time, I loaded up the family and we went to look at it. I could tell it needed some work, but we were excited about it. After a short inspection, a little negotiating, and lots of daydreaming of all the fun we could have, I handed off the cash and we headed to DMV for tags and title stuff. Brooke called our insurance company on the way. We were all set. I drove it home and immediately started packing it up for CTB fun Caravan. It drove and towed fair enough. And it sure was nice not sleeping In a tent. But Ella woke up coughing like a barking duck and was having slight breathing problems. Kind of odd, but she is sensitive to air quality conditions more so than the rest of us. The weekend went well and we headed home. Time for a real cleanup and to make this thing our own! Scott Fields Jeep raffle benefit is live! 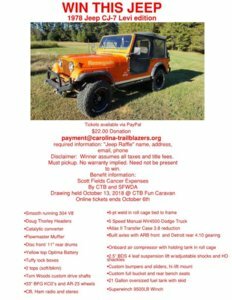 The Carolina Trail Blazers has a plan to help Scott with some money both via a grant from Southern 4 Wheel Drive Association (approved and $$ on the way) and matching club funds. This will support a vehicle purchase (his CJ7) which will then be raffled off to raise more money for him. mark all payments "For Scott"
All money collected by Sunday April 22, 2018 will be given to Scott the following week. I will provide an account of all additional money raised and post here. Thank you on his behalf for the love and support. The plan was simple. Ten days, nine nights. Drive from Raleigh to Asheville and back. Don’t drive further than 100 miles a day. Don’t leave North Carolina. Don’t drive on the highway. Camp every night. Dirt every day. Ten days, nine nights, 1000 miles. Three weeks to get ready. What is broken - thermostat or water pump, or..?